If you’re a fan of the bulky and edgy feel of the industrial decor style then you’re going to like what we’ve prepared for you today! The industrial decor style is rather new in the world of interior design and it’s perfect for creating a fresh and very contemporary visual appearance in your bathroom. An industrial bathroom design usually includes exposed brick walls, dark grey color schemes and an interesting decorative palette. 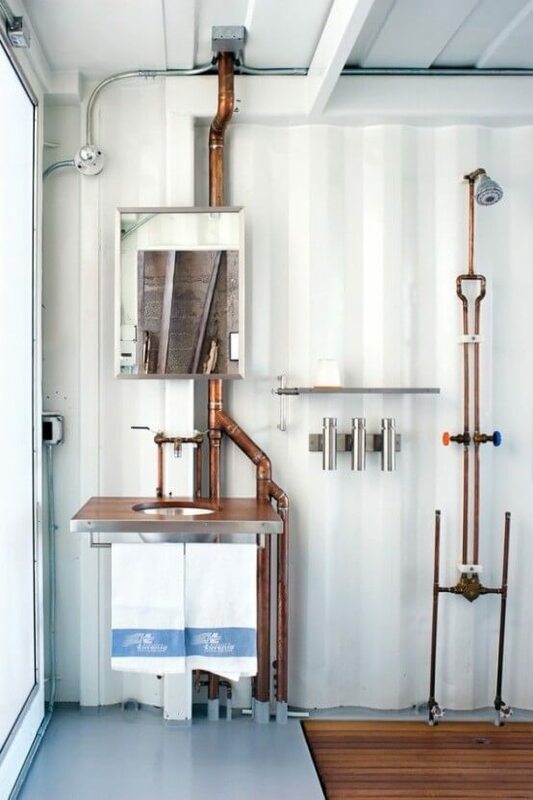 In this post we’ve gathered a showcase of our top industrial bathroom designs to serve as an inspiration and provide you with cool ideas. Take a look at the showcase below and enjoy! The small and narrow design of this bathroom is visually enhanced with the bright beige color scheme and the glass shower enclosure. 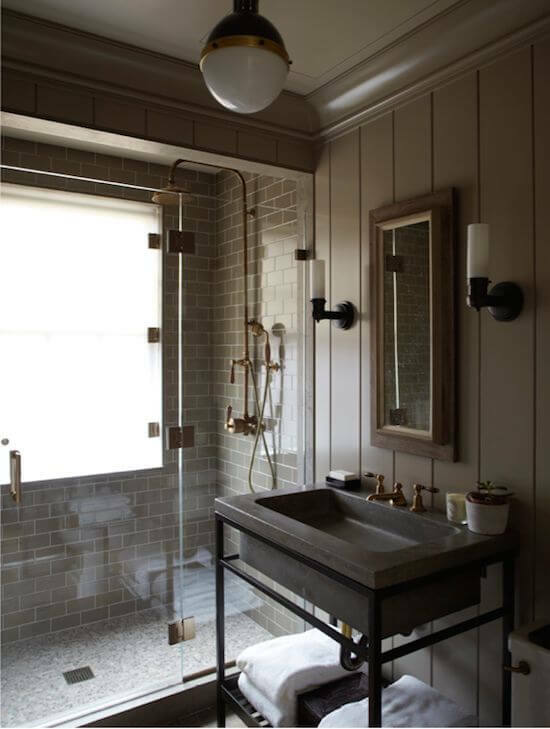 We love the brass motifs and subway bathroom tiles in the large walk in shower. They bring a bold and contemporary feel to this industrial bathroom. The clean white color scheme here mixed with the walnut wood floor make a natural and crisp appearance in this cool industrial bathroom that also appears bold and dramatic. 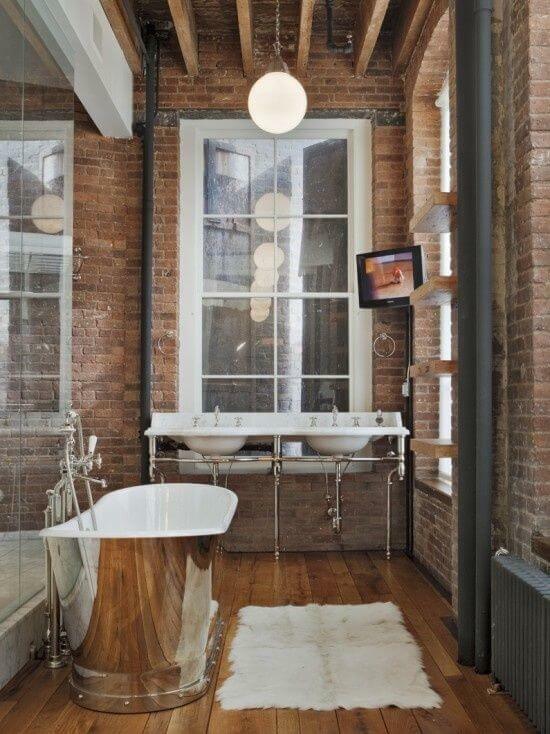 The exposed pipes and shower faucet create the industrial setting giving the space a modern and urban feel. This quite chic bathroom with its exposed brick walls and natural oak wood floor has a very contemporary and cozy appearance largely sue to the white shag rug which brings some much needed softness and texture to this space. The shiny silver bathtub stands out magnificently and strikes with a chic glare in the bold industrial bathroom. 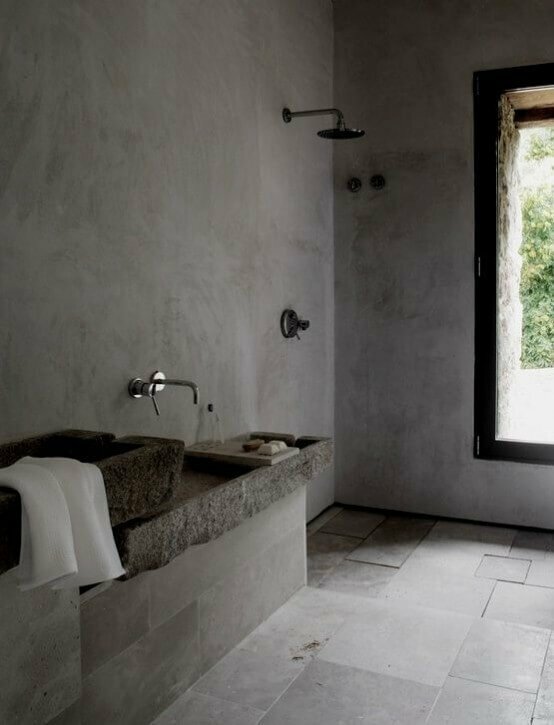 Bare concrete walls and concrete floor tiles make the perfect foundation for an industrial style bathroom. The minimalist setting and the stand up black shower create a totally bold and modern appearance. Everything here is super sleek and the sinks are some of the most unique we’ve ever seen! 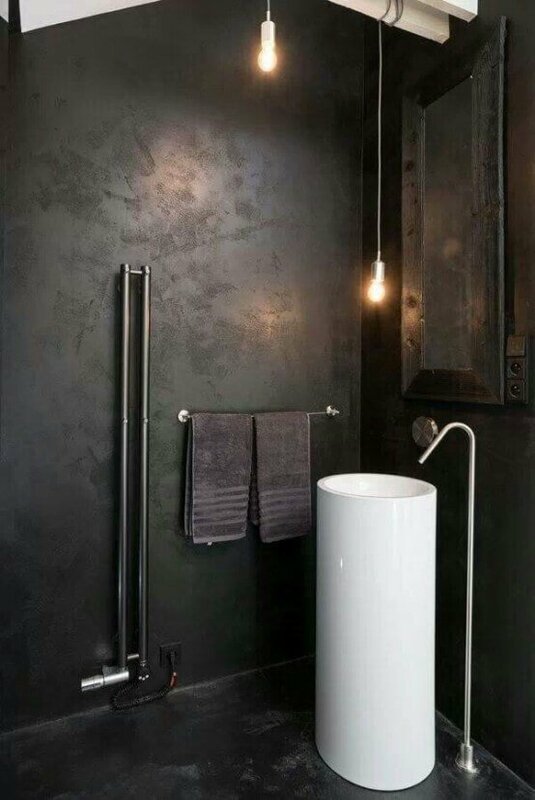 The bulky black steel wall with exposed black pipes brings a dramatic and sensual feel to this bathroom. The white cylinder bathroom sink creates a dramatic contrast giving the space a modern and contemporary appearance. Bare concrete walls and a white sleek floating vanity with a contemporary cube bathroom sink provide this industrial bathroom with a dramatic, sleek and cool appearance. The red hanging light fixtures bring a lively and modern touch to the space and also provide some much needed color. This bathroom is super modern and contemporary right? 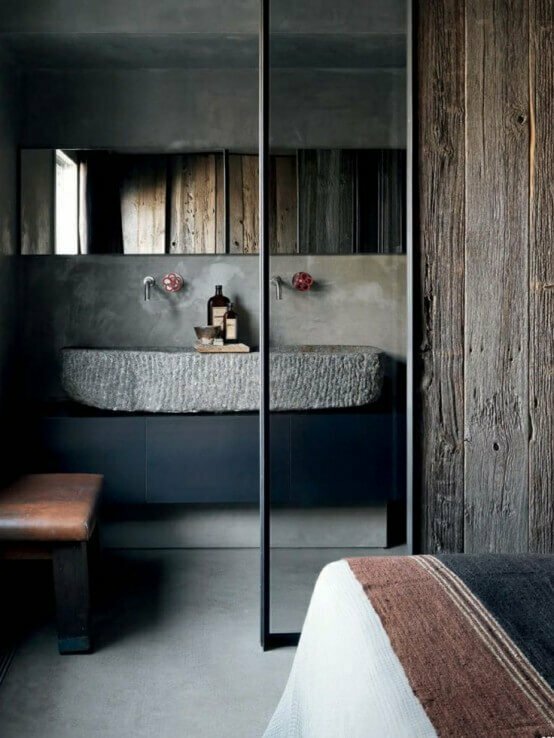 The natural stone sink, the concrete floor and rustic wood panels make the space look bold while bringing the industrial style to another level of chic and contemporary. This bathroom is strong and solid in its visual appearance due to the bold arrangement of wood planks, exposed vents, concrete walls and that sleek white ceramic bathtub. 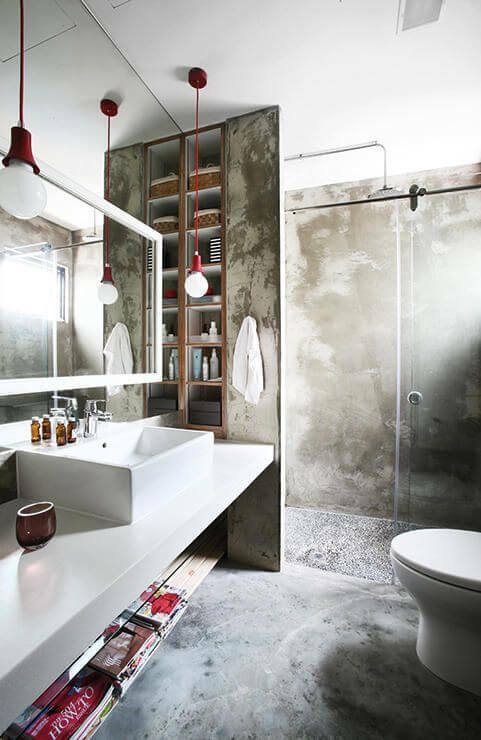 we absolutely love the vibrant and radiating charm of this super dynamic and yet refreshing industrial bathroom. 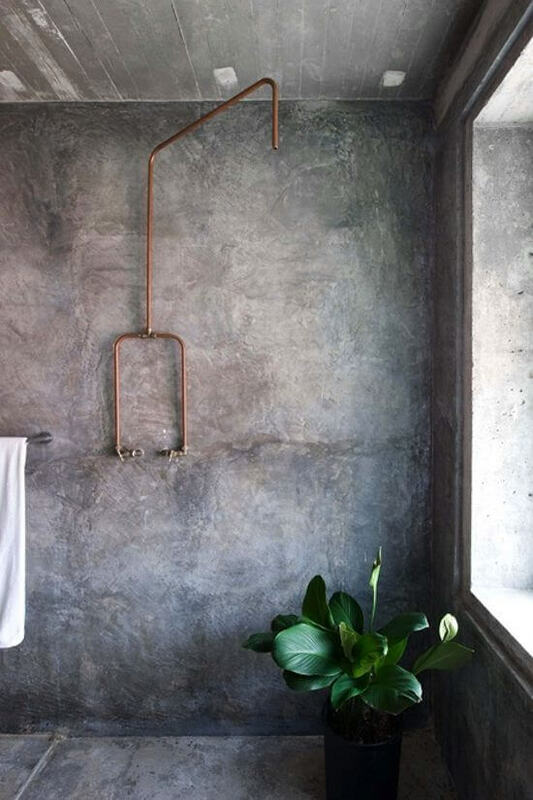 The minimalist setting and the unique bare bones brass shower faucet create a dazzling ambiance when combined with the concrete wall and some natural plants.